What do the leds stand for on my Live Pen™ 1? Action led shows communication status of the pen. 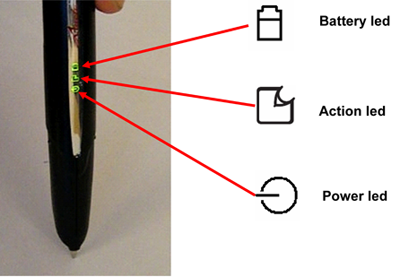 If it flashes green, the pen is communicating with a device, if it flashes red, there is a communication problem. Power led shows if the pen is turned off (no light) or on. Green light means that the digital pen is ready to use and all writen data will be stored in the pens memory. For more details and explanation on vibrations see Use's Guide (link under Futher Information below).